The U-handbag blog is hosting an exciting Extreme Sewing Holiday Giveaway with some terrific prizes! 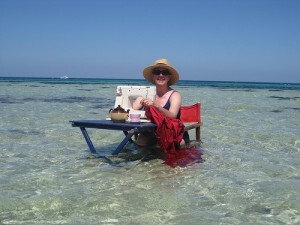 All you have to do to enter is submit a picture of yourself doing some extreme sewing, which simply means grab your sewing machine and take it somewhere that you normally wouldn’t sew, like this hilarious lady who is sewing up a fitted bedsheet in the Indian Ocean off the southwest coast of Western Australia. Once you’ve submitted your picture, just post a comment and a link to it on the official giveaway page. The grand prize is a new Janome 8077 sewing machine, which will shipped out by Janome so the contest is open to everyone regardless of location. There are also two runner up prizes – a Janome Mega Sewing & Craft Tote plus a “Sewing Bible: Curtains”, book AND a Janome Mega Sewing & Craft Tote along with a “Free & Easy Stitch Style” book. The three winners will be randomly selected on December 20th so there is still time to enter, and there are only 44 entries so far so your chances of winning are good! Go do some extreme sewing and maybe you can win yourself a nice Christmas gift!